Thurles town has many well kept historical secrets as yet to be viewed by discerning tourists. Over the coming weeks and months Thurles.Info will reveal many of these closely guarded secrets for the first time, to the rest of the world. Currently Displayed At: Tipperary County Library, The Source Arts Centre, Cathedral Street, Thurles, Co.Tipperary. Harp Design: A large low headed design measuring at its longest, 92cm and accommodating 35 strings. At the upper end of the harps pillar four holes mark the place where a plate of gold was once attached. This plate, which is now missing, is believed to have borne the following engraved words in Irish, “This is the harp of Cornelius O’ Fogarty“. The O’Fogarty harp was owned and played by the gentleman harper Cornelius O’Fogarty (1661-1730) then resident at Castle Fogarty, County Tipperary, and has remained in the ownership of his descendents ever since. Cornelius O’Fogarty was a a musicina of note and chief of his ancient family from Ballycahill, Thurles. He fought in 1690 at the Battle of the Boyne on the side of King James II. He also took part in the defence of Limerick city during the that famous siege and was a close friend of Fr. Edmund Cormack, one of the last Cistercian monks of Holycross Abbey. 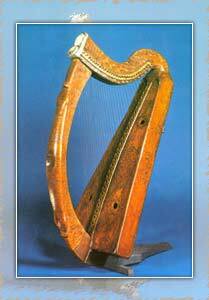 General history of the harp in Ireland. The harp, as an instrument, possibly moved westward from Egypt to Greece and Italy in ancient times, in or around the 6th century B.C. It first appears in medieval Europe in carvings and illuminated manuscripts in about the 8th century. The oldest existing harp, found at Ur in Sumer, dates from 2600 B.C. The tombs of the Egyptian Pharaohs contained elaborate golden harps that were used in ensembles and worship. As an instrument it became very popular in Ireland, beginning about the 10th century, where it eventually became the country’s national symbol. 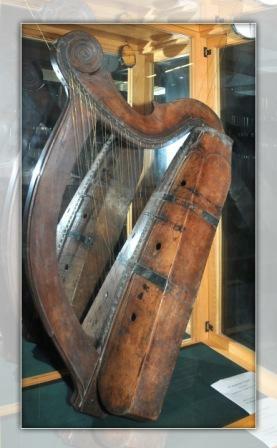 Another of Irelands venerable antiquities, the so-called Brian Boru’s Harp, was almost certainly a harp of the O’Briens. It possibly dates from about the year 1220, having been made for Donnchadh Cairbre O’Brien, King of Thomond, whose death is recorded on the 8th March, 1243. A detailed account of its workmanship is given by Petrie and other writers. In all of these instruments the crosspiece held nearest the player is a hollow resonating chamber. The so called Brian Boru harp, in1782 was donated by Colonel William Burton Conyngham to Trinity College in Dublin and can be found displayed there in The Long Room. It is about 80 cm (32 inches) high, with 30 brass strings. Like the Cornelius O’Fogarty Harp the sound box is carved from a single piece of willow with a fore pillar made of oak. The harp, and specifically the Clársach (Gaelic word for harp), has long been Ireland’s heraldic symbal and appears on coat of arms which were officially registered as the emblem of the state of Ireland on 9th November 1945. The image of the harp is used on coins, passports, and official documents of the Irish state. It remains the official seals of the President, Taoiseach, Tánaiste, Ministers of the Government and other officials offices to this day. The harp, in relief on 1928 coinage is based on the Galway and Trinity College harps. A more modified version was introduced when manufacturing our 1939 coinage, and the present Irish euro coins are largely based on this latter 1939 version. Between 1792 and 1802 John Egan established a factory in Dublin to build harps. It was he who developed the mechanism which connected, for the first time, the string arm hooks with levers, which allows musicians to operate with their feet also. In 1367 a ‘Statute of Kilkenny‘ made it penal for any Anglo Irish or English person to receive or entertain Irish harpers. The fear was that these Irish entertainers were spies that informed the Irish rebels about Anglo Irish movements. In medieval Scandinavia the harp was seen only as an instrument for gentry. Any peasant found guilty of playing a harp was condemned to death. A harpist uses only the first three fingers and thumb of each hand to play; the little finger is never in action. The majority of concert harps used around the world are now made in Chicago, Illinois. A concert grand pedal harp today weighs around 80 pounds and is approximately six feet in height. I have enjoyed reading your piece on the O’Fogarty Harp, and yes its very true the amount of hidden history in Thurles and its surrounding areas almost hidden from tourism and in some cases the local population for whatever reasons. It has always been a dream of mine to have the Black Castle off Thurles’ Parnell St roofed and in time brought back to some vision of its former glory and the whole area around it opened up and pedestrianised, what a musieum it would make and maybe help aleviate the pressure for space and suitability from St Marys church and Famine Musieum. If during these changing times we cannot appreciate with forethought the benefits of forward thinking and the utilisation of dorment features of our once significant walled town, to attract with confidence tourists in greater numbers and have for them a realistic and convincing tourism schedual of sights (not forgetting that Thurles was the sight of the utter defeat of an Anglo Norman army led by Strongbow himself by King Rodericks son Connor with men of Leinster supported in numbers by men of Thomond led by Munster king Donal Mor O Brien) all thats available on that amazing historical achievment is a faded plaque on the side of a house in Loughtagalla. I’m delighted to see initutive been taken and a genuine effort to begin Thurles’ re-establishment as a strong progressive town with alot to offer the tourist of history spanning millenia back to the earliest peoples to occupy this ancient and rich Island.